ThinkForex is a Forex broker that started life in New Zealand in 2010. It then moved its headquarters to Australia, in 2012. ThinkForex is a brand name owned by TF Global Markets (Aust) Pty Ltd, which is licensed and regulated by the FCA (Financial Conduct Authority) in the UK. ThinkForex itself is regulated by the Australian Securities and Investments Commission’s (ASIC), in Australia, and is also a member of the Financial Ombudsman Service. However, ThinkForex, does have its own internal dispute handling process, but the FOS, can be used as a last resort. Both FOS membership and an internal dispute process are in fact very unusual for a Forex broker, so should definitely be considered something in their favour. ThinkForex operates a non-dealing desk, as well as a market maker model of brokerage services, which means you get the best of both worlds. They also allow traders to hedge scalp, and high speed trade, which is rather unusual. Traders who choose to sign up with ThinkForex are given access to global CFDs, metals, and Forex markets. 35 of the most popular currency pairs are offered, with low spreads and swift NDD execution. Leverage offered is up to 500:1, and there is five digit pricing. Contracts for difference are also available across equity indices, energies, other instruments, and asset futures. 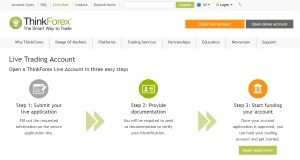 Trading can be done on a long or short basis, and there is access to global markets. Gold and silver are also available for trading, across a range of contract sizes. Contracts can be standard or mini, and they have no expiration. 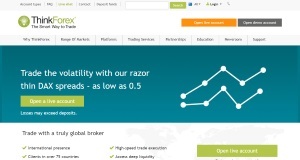 ThinkForex have decided to stick with the popular MetaTrader. As their website says, it’s a platform that has it all. Automated trades can be executed easily with MT4. It’s no wonder it has become one of the world’s most popular trading platforms. It is able to run thousands of different automated trading strategies, also known as Expert Advisers, as well as optimising traders own EA strategy by backtesting them. MT4 also gives a wealth of options for mobile trading, and gives traders absolute freedom, whether using iOS, Android, Windows or Blackberry mobile operating systems. Standard account – Minimum deposit of $250, maximum leverage of 500:1, no commission, and a minimum contract size of 0.01. There is also live support 24/6, and daily insight. Pro account – Minimum deposit of $2,000, maximum leverage of 500:1, commission of 3 units per side, and minimum contract size 0.01. There are also a few extras, such as the services of an account manager, and the tools we’ve previously mentioned. VIP account – Minimum deposit of $25,000, maximum leverage of 500:1, commission is negotiable, and the minimum contract size is 0.10. One extra special addition with a VIP account is the use of MetaTrader 4 FIX API. This allows direct market access to Australian customers familiar with FIX protocol. For new customers, and those who are looking for an introduction to market trading, ThinkForex has a lot to offer in their educational centre. As well as videos and live events, there is the FX University, and a number of wide ranging topic guides. From the very basics, right up to an understanding of technical analysis and candlestick patterns, ThinkForex is able to cover most important subjects. The customer support team includes multi-lingual staff who are available 24 hours a day, during the normal Forex trading week. Contact is made via live chat, telephone, or through the contact form available on their site. There is also the option to open a support request and get help right away. It seems that ThinkForex is a very trader-friendly broker, and while it may have some rather tight spreads, it is nevertheless a broker with plenty to offer all types of trader. And it also appears they are happy to welcome everyone in. Whether you are a beginner, a seasoned veteran, or the type of trader who loves a spot of scalping.